My edition: Paperback, published on 7 November 2013 by Pan, 502 pages. Description: Portobello – home to the world-famous street market, Notting Hill Carnival and Clem Alderton. She's the queen of the scene, the girl everyone wants to be or be with. But beneath the morning-after makeup, Clem is keeping a secret, and when she goes too far one reckless night she endangers everything – her home, her job and even her adored brother's love. Portofino – a place of wild beauty and old-school glamour, and where a neglected villa has been bought by a handsome stranger. Clem Alderton grew up in Portobello in London and feels right at home wandering the famous street market or having a cupcake for lunch at Hummingbird Bakery. She now shares an expensive flat with her brother just streets away from her brother's company, Alderton Hide, where she too works, though her job comprises of little more than being the face of the company to clients who are unable to resist the charms of the gorgeous young woman. Seemingly without a care in the world, and unattached thanks to her 12-week-rule when it comes to dating the hot men that fall at her feet, Clem is enjoying her life to the fullest. She spends her days going from one party to the next only stopping occasionally to show her face at work or her parents' house when summoned. Just as people around her start to wonder when Clem will finally grow up and be responsible, she is in her late Twenties after all and hasn't held down a proper job yet, she once again shows them that she's an egoistical party girl as she ruins Alderton Hide's prized show model (worth several hundred thousand pounds) and with it the contracts the company needed to stay in business. I admit that for the longest of time I was struggling to get into this novel. I was completely deceived by the book's cute cover and title and foolishly failed to properly read the blurb before diving in. Because of that I was expecting a sugar-sweet and predictable chick-lit story, with a nice and funny main protagonist and possibly a plethora of eligible bachelors, which this is anything but. Instead main character Clementine, or Clem as she's known to friends and family, is a spoiled rich girl that at first I found incredibly unlikeable. In fact I would go as far as to say that her selfish and foolish antics really annoyed me and I was surprised that her family, and her brother in particular, let her get away with it for so long. But of course there is much more to it than Clem just being spoiled and immature for her age and when the story shifts from Portobello in London to Portofino in Italy the reader gets to see a really different side to the character's personality and she instantly becomes a much more interesting and intriguing individual. I don't want to say more about that part of the novel as I don't want to spoil it for prospective readers but let's just say that the heart-wrenching revelations will have you on the edge of your seat until the final page. Clem might not be the easiest person to care for in the beginning, but stick with her and this book and you'll be rewarded with a gripping and thought-provoking story. 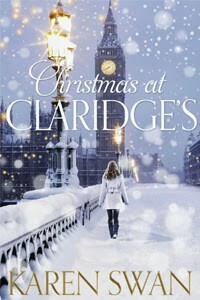 You can purchase your own copy of Christmas at Claridge's from Waterstones, Amazon.co.uk, Amazon.com or your own preferred retailer. Many thanks to the publisher for an advanced copy of the novel in exchange for an honest review.